I have updated Parallels Desktop 12 for Mac to version 12.1.0 (or later) and since then I cannot switch between browser tabs in Windows virtual machine (VM) using Ctrl+Tab keyboard shortcut. The 12.1.0 update has enabled the tabs feature of macOS Sierra for Parallels Desktop for Mac (more about tabs in macOS Sierra overview on Apple website). This macOS Sierra feature uses Ctrl+Tab hotkey as a system shortcut for switching between application tabs on host OS. 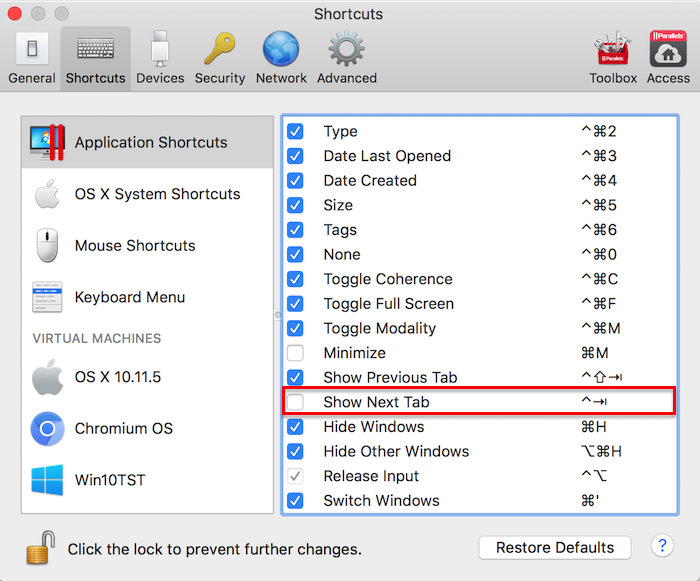 If you want to use the same keyboard shortcut in your virtual machines, you need to change corresponding option in the Parallels Desktop for Mac preferences. Switch to Shortcuts tab > Application Shortcuts. Scroll down and disable Show Next Tab keyboard shortcut. Now Ctrl+Tab keyboard shortcut will work in the virtual machine.